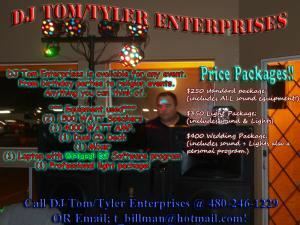 DJ Tom has music for all events this includes up to date Pop, Hip Hop, Country, Disco, Motown, Dubstep & Oldies. I also have party lights for night time events. I come with 2 1500 watt speakers, a 4000 watt amp, laptop with Virtual DJ Software and an external hard drive with hours and hours of music. No event is too big or too small!